Welcome to the Falcon Watch Company. As of January 18, 2012 Falcon Watch has been sold to Saltzman's Watches & More. 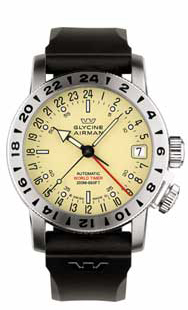 Saltzman's Watches & More will now act as the sole service center for Glycine watches for North America. We are proud to continue the tradition of fine service and sales for Glycine watches that Mr. Werner Siegrist has maintained for longer than anyone else in the world. We look forward to speaking and working with all of the customers that Werner has treated so well for so long, so please do not hesitate to contact us with any questions you may have. We have been servicing watches for over 70 years and 3 generations so we certainly know how to take care of customers. So, WELCOME TO THE NEW FALCON WATCH CO.!!! We will continue to service Glycine watches in the same manner which you have been accustomed but please also know that we service any other makes and models, and if you have any specific questions about another watch brand repair please do not hesitate to call or email us at your convenience. We will also continue to sell Glycine watches and bands, and if there is anything you do not see on our site, just reach out to us and we will be happy to get it for you! "When you think Glycine, think Falcon Watch Company"